Availability: We own 15 kits, each with a suggested grade level. You may check out kits at the grade level(s) you teach OR BELOW. For example, if you teach a 2/3 class, you may check kits for grades K-3, but not kits reserved for grades 4, 5, or 6. ONE kit at a time, please! Treat with CARE! Each Art Kit cost the district between $150 and $225 to purchase. They were expensive! Please keep ALL parts and pieces together while you have a kit in your room. Costs related to lost kits and/or replacement pieces will be charged to each school. Click on the kit title to go to the Project ARTiculate website! The site includes objectives for each lesson, a list of materials needed, and a complete lesson plan. Students will examine the traditional lifestyle of Athabascan people. They will look at clothing, and the types and materials used for decoration. 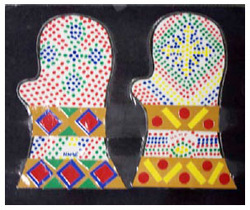 After looking closely at beading, students will design their own beaded mitten. Currently available for check out! Students learn about the habits and habitats of Alaska’s bears. After reading and sharing a children’s book on bears, students explore the topic of hibernation. They create a drawing of a hibernating bear, complete with cut paper shapes representing the bear’s dreams. Currently available for check out! After sharing the book Where are You Going? To See my Friend, students discuss real and abstract artwork. They will learn how to use texture rubbings to create torn paper animals and people. Students then assemble a collaborative work of art displaying characters from the book. Currently available for check out! The book No One Can Ever Steal Your Rainbow by Barbara Meislin is used for inspiration. The students create a “peace” mural by designing their own rainbow on 'puzzle pieces' and assembling into a class mural. Each student writes a wish for the world and the wishes then become part of the art. Currently available for check out! Students look at various examples of cultural masks, discussing symmetry and design. They then make their own symmetrical mask using paper and oil pastels. Currently available for check out! Students study the animal paintings of Franz Marc, a German painter. They look for simple shapes in the animals that he painted, and also in the Alaskan animals that they will draw. Each student makes one animal pattern and traces it to make a group of animals. They design their art using overlapping animals and warm, cool and neutral colors. Currently available for check out! Students learn about the habits and habitat of caribou and their relationship to Athabascan people. They draw lichen growing on the tundra using layers of land to show perspective. Tissue paper and watercolor paint embellish the caribou on the tundra collage. Currently available for check out! Students look at 2D and 3D art and artists. They create their own 3D environment using paper folding and cutting techniques. Embellishments are added with color and pattern. Currently available for check out! This lesson is designed to teach in two sessions. Students study the work of artist, teacher, author and illustrator Faith Ringgold. 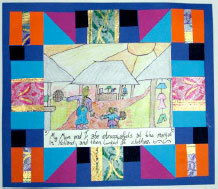 They create a story quilt with a well-developed drawing based on a personal memory. Finished work includes a written memory sentence and a colorful pieced border. Currently available for check out! Students study the life and art of Georgia O’Keeffe, focusing on her landscape painting. They create cut paper and oil pastel landscapes working from photos of Alaska. Currently available for check out! Students learn about the life of writer, biologist and conservationist, Rachel Carson. Students learn to use complementary colors to show the effects of pollution on their plant. They create a before and after line drawing of an Alaskan plant using watercolor paints for color. Currently available for check out! Artists and designers often look to nature for inspiration. French artist and naturalist E.A.Seguy drew intricate scientific illustrations of butterflies and created designs based on his drawings. Students learn about Seguy and produce a 3 dimensional paper sculpture butterfly with colored paper and oil pastel patterns. Currently available for check out! Students discuss northern migrations and study photos and artwork showing migrations of cranes, caribou and salmon. They consider design elements that create a sense of movement before using watercolors, oil pastel and cut-paper stencils to create a mixed media artwork of cranes, salmon or caribou in motion. Currently available for check out! Students look at and learn about the collages of contemporary artist Miriam Schapiro. They paint a background and use mannequins to draw and create an action figure. The parts are embellished and assembled into a collage. Currently available for check out! Students look at them many paintings of Sydney Laurence, a renowned painter of Mt. McKinley. 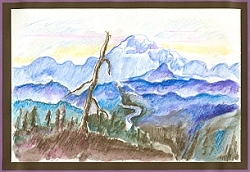 Watercolor pencil painting techniques are used as students learn about contour lines, value, shading and the importance of contrast to create their versions of the mountain. Currently available for check out!